FBI and ICE officials returned to the New Bedford, Massachusetts apartment on Saturday and re-arrested the two men who were brought in on Friday. The two men were led away in handcuffs Saturday afternoon. Police say bomber Dzhokhar Tsarnaev may have once lived with the men at the residence. The two men, Azmat and Diaz, are believed to be from Kazakhstan. Federeral agents re-arrested the two roommates after police received information that there might be a twelve-member Islamist sleeper cell. Two men are in federal custody as the FBI investigates a possible terror cell that may be linked to suspected Boston Marathon bombers, Tamerlan and Dzhokhar Tsarnaev. 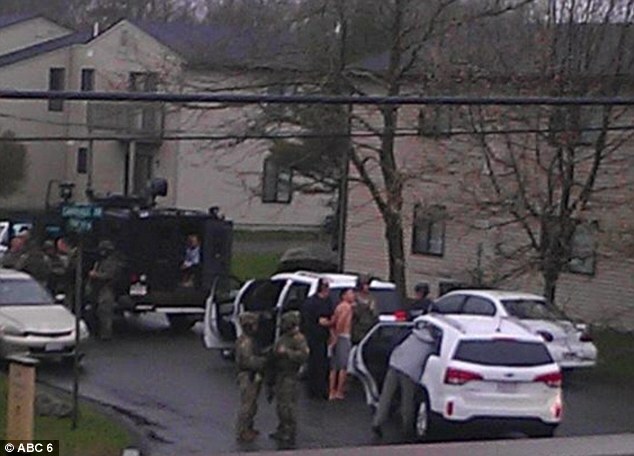 The men, known only as Diaz and Azmat, were arrested Saturday, April 20, in New Bedford, Mass. While the suspects are being held on immigration violations, their arrest was made after police received new information regarding a possible 12-member terror cell operating in the area. Investigators say the group’s main focus may have been training the brothers to build compact explosives like the bombs used in the marathon attack and those thrown at police officers Thursday night during a car chase. As many as six makeshift bombs were tossed from a stolen SUV as police chased the Tsarnaev brothers between Cambridge and Watertown. One of the devices was a pressure-cooker bomb that exploded and became embedded in the body of squad car. Others were pipe bombs and homemade hand grenades. A pressure-cooker device was also used in the marathon bombings.